For three summers we have filled and lifted 5 gallon buckets to water the plants. That’s fine if you have a strong back and a lot of time. Currently, we are working on a setup to move the water from the cisterns around the orchard using less effort and time. Last week, Nancy pumped 350 gallons from the older cisterns to the new one. She treadled or, should I say, she stepped. For months I have been looking for a treadle pump because it is the preferred method for many farmers all over Africa and Asia. I searched one lead then another but there was not a treadle pump to be bought in the U.S. One U.S non-profit treadle pump developer insisted that it was against their policy to sell in the U.S.
“Amazon!” What? Amazon? You have to be kidding. I clicked the link and there it was. On sale for $129. Down from $340 and, free shipping. The thing weighs 50 pounds shipped! This could not be real. The manufacturer called it a stepping pump. Who would ever search for that phrase. No one calls it a stepping pump. There are so many citations of their value and how they work and, in every instance, they are known as treadle pumps (http://www.appropedia.org/Treadle_pump_design_optimization). One click to purchase. We got the last one. The screen then came back up to report, “currently unavailable”. We chewed our fingernails until the day it arrived. Nancy figured it was all some kind of scam … to good to be true. But, we got the treadle pump … uh … er … I mean stepping pump. It works. It won awards and I can see why. Nancy pumped with little effort, all the while checking her email. 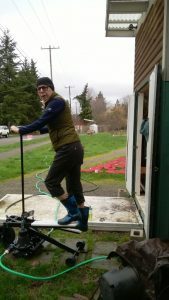 This entry was posted in Construction, Grants & Fundraising, Uncategorized and tagged treadle pump, Water conservation on February 7, 2018 by Ruth.